I know, I know, another strawberry recipe? I can't help it, I am on a strawberry kick lately! I really wanted to make these for Easter, but they weren't on sale that week. Go figure! I did make them for last years party and they were the first appetizer gone. They are super easy to make and deliciously sweet! Rinse strawberries, then cut the green top off. Flip strawberry over, and cut an X through the bottom, stopping about 3/4 of the way down. Using a pastry bag, or a sandwich bag with the end snipped off, fill bag with filling, then poke through the X. Squeeze filling until strawberry is full. Top with melted chocolate, if desired. This is my favorite time of year to buy them. They are so sweet and yummy! If you make a good recipe with yours, make sure to share. I'm really enjoying them lately! I never even thought of them for date night. Great idea! I just usually have them in my party recipes folder. Ooh that looks delicious. Strawberries and cream cheese? what could be better! I pinned! Thanks for sharing. Be careful! These suckers are addictive! My batch is already gone and I am considering making another round! oh yum!! we love strawberries here too!! 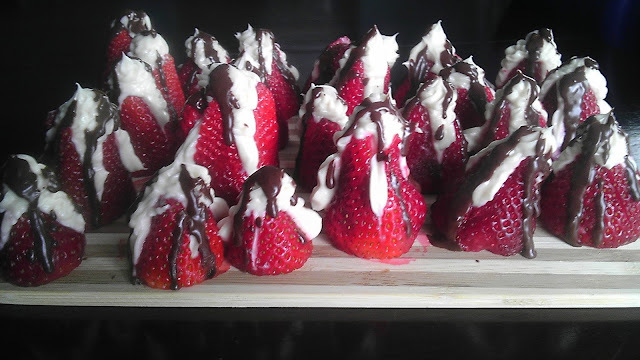 ohhh stuffed strawberries........................ yes please!!! Yum, Thank you for linking to the Thursday Favorite Things hop. Hugs and happy weekend wishes! Pretty sure that's the most delicious looking appetizer I've seen for awhile. I love strawberries!